The votes are in, and the people have spoken! At the 2018 People’s Choice Awards, the stars of the Marvel Cinematic Universe won big, taking home awards in five categories — including Avengers: Infinity War winning movie of 2018. Meanwhile, Freeform’s Shadowhunters: The Mortal Instruments brought home four of the five awards it was nominated for, and rapper Nicki Minaj and K-Pop group BTS both dominated the music categories. Victoria Beckham and Melissa McCarthy each took home two of the three very special “icon” awards that were handed out. Alternately, if you just want to know who won and check out some highlights, we’ve got you covered. Keep scrolling to find out who came out on top and which moments we can’t stop talking about. As for the major highlights from the evening’s excitement, here’s what you may have missed that’s worth checking out. 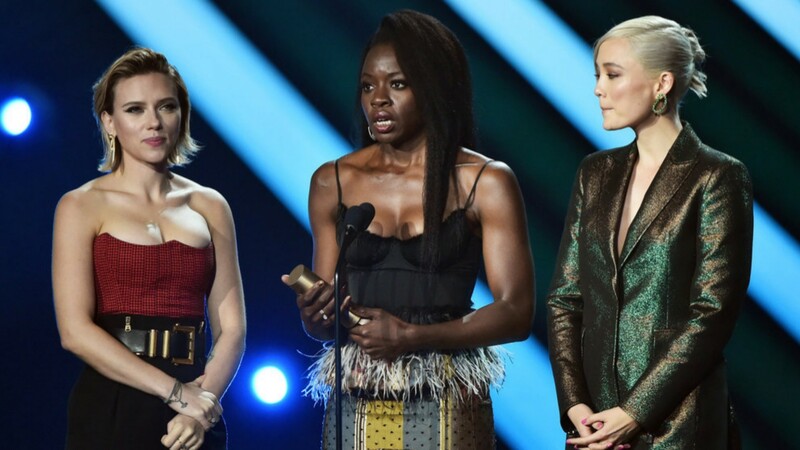 During their speech accepting the award for movie of 2018 for Avengers: Infinity War, stars Scarlett Johansson, Danai Gurira and Pom Klementieff dedicated the award to “the great state of California.” Commenting on wildfires that are currently devastating the southern part of the state, Gurira said, “The devastation and the turmoil that we are going through right now, that people are going through right now out there — we just want to say we are with you.” She also thanked first responders and encouraged the PCAs audience to help in whatever way they can. Melissa McCarthy took home the people’s icon award and got emotional about how much it means that so many people voted for her. “I’m thankful to you because you actually engaged and you cared about things,” she said. “You took the time and put the effort in to have your voice be heard, and that is tremendously inspiring to me.” She also, of course, employed plenty of comedy to elevate what she had to say. Nicki Minaj took the chance to flirt with Black Panther and Creed 2 star Michael B. Jordan, and yes, it was just as wild IRL as it sounds. During his speech for accepting the award for nighttime talk show of 2018, Jimmy Fallon jokingly thanked his “soulmate,” Justin Timberlake, for his success. On the red carpet before the actual show, Nikki and Brie Bella challenged the Kardashian sisters to a wrestling match, which would no doubt draw huge views if it ever actually happened.